This Bronzeville Chicago Youth Center facility hosts what is perhaps the preeminent collection of public community art in the city. 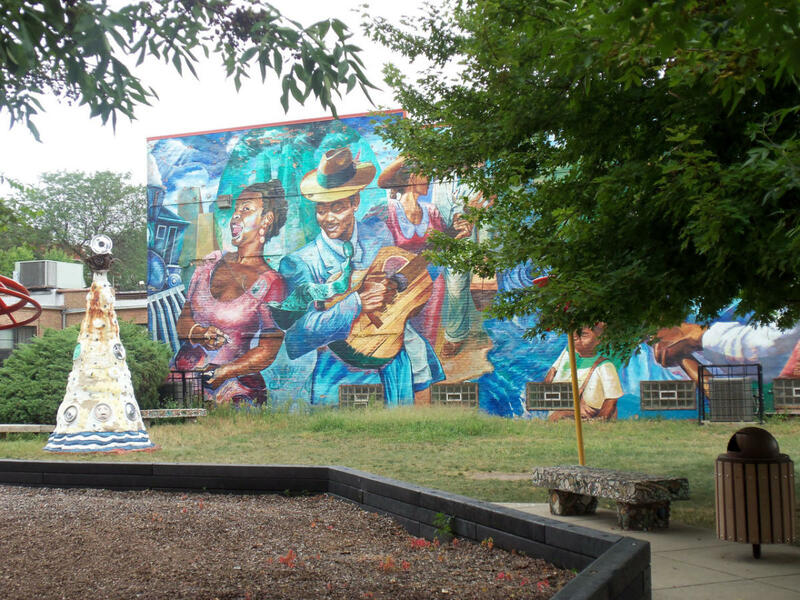 In 1991, encouraged by the Openlands Project, the center began transforming three vacant lots south of its building into a sculpture park, playground, and community garden. Mitchell Caton and Calvin Jones’s classic CPAG mural, Another Time’s Voice Remembers My Passion’s Humanity (1979), was beautifully restored by Bernard Williams in 1993. This jazzy montage of figures and textile patterning opens with the pairing of a wall-high African mask and the face of a contemporary woman, linking the African past with the present community. On the right, the striding figure of an elderly lady with her shopping bag honors the strength of the black matriarchy. The Great Migration (1995), led by Marcus Akinlana, is a 2,700-square-foot historical narrative documenting the migration of African Americans from the South to Chicago after World War II. The mural contrasts a rural, agrarian past with the proliferation of urban industry and entertainment. Three artists were commissioned in 1995 to create sculpture projects at the Donnelley: Circus Shrine, a whimsical cone-shaped cement and hubcap sculpture by Kevin Orth, Totems, six carved ailanthus tree trunks by David Philpot and Milton Mizenburg, and Meditation Grotto, a cement structure embedded with modern debris and ancient fossils by Mr. Imagination. The art park also includes works made with neighborhood children, including two cast-concrete ceramic relief and stone benches by Phil Schuster; a mosaic-tile doorway by Kiela Smith, a sidewalk fresco by Smith and Rene Townsend, and entranceway concrete mosaic markers by Townsend.